While in the Peace Corps in The Gambia, Mukee Design founder Derek Keenan was struck by something: people there reused everything. Experimenting with different crafts back in Denver, he found that old skateboards were an existing material waiting to be repurposed. 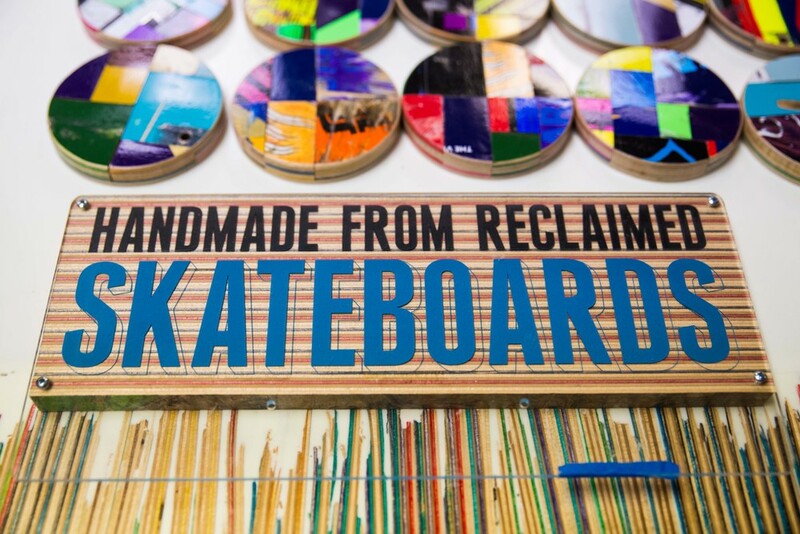 Now, Keenan shapes and coaxes discarded boards into wearable art and beyond. What does MUKEE DESIGN mean to you? It’s my chance to try out things that I want to do. I had been in the Peace Corps, and when I got back I wasn’t sure what I wanted to do. Looking at a few different jobs, and seeing the kinds of qualifications needed, I felt like I should just see what I could do on my own. I have a degree in industrial design—I used to photograph craft shows and it’s partially what made me start thinking of what I could make and sell. At the Peace Corps, I was in The Gambia in West Africa and I saw people there reusing everything, and I thought that was really cool. Eventually, I showed my stuff to Fancy Tiger, and they asked if I wanted to have a trunk show there. I did, and people turned out and bought it. I started doing little craft fairs and got really into it. Then, I started producing like crazy—I had a backpack and a flashlight, and I bought a credit card machine and I would go to bars with that and set things out and show people with a flashlight. I started doing some large order work with New Belgium, and that’s partly what really helped me pay off my equipment and keep moving forward. Those first couple years, I’d ask if I could set up a table wherever I was—it made me feel weird, but that helped me sell better, people didn’t expect it and were intrigued. I think that because I make things out of skateboards, people are incredibly interested in my work—a little light goes off. Broken boards collected and given new life. Jewelry, table tops, and large-format art pieces with more in the works. HOW DID YOU START COLLECTING SKATEBOARDS? I used to skateboard and did graphic design work for a local shop, 303 Boards. I did that in the 90s, and I thought, where could I get material that already existed out there, that I could reuse? Kids skate until they break their board and then they would change the wheels, leave the broken board, and go with that—I went to a few skate shops and asked them what they did with the broken boards and they said they just throw them away. I said, ‘well wait a minute, can you save them?’ At first, it was hard because they were so used to throwing them away, and I was really persistent. They finally started saving them, and nowadays, I have so many skateboards that I don’t really want any more, but when they call me I’ll still come and get them because it was so hard to get them in that habit. ARE THERE PARTS OF THE SKATEBOARD THAT WORK BETTER FOR SPECIFIC PROJECTS? Certain parts work better for jewelry because they’re flat. When I cut out those parts, I still save the wood that I didn’t use and I’ve been doing that since 2008, so I have a huge pile of scraps—that’s why I’ve moved in to making larger pieces like tables tops and sculptures. Most recently, it’s the Star Wars A-T-A-T, but I call it skate-skate. I was in Brooklyn a few years ago for a craft fair, and I was walking around and went in a store that had all of these toys and figurines of the A-T-A-T—this guy collected them. I thought then that I could make one out of skateboards. I was slowly working on it, and a few gallery friends told me they were having a show with a Star Wars theme in June—so that motivated me to finish it. Someone told me to put it on Reddit—I didn’t even really use Reddit, but I did, and it had almost 300,000 views before the weekend was even over. I've already started a few more. That was exciting, because after it went crazy on Reddit, it got picked up by blogs and it went viral. It’s the only time that’s ever happened. It gave me a big boost of encouragement—that I should just keep on doing this. WHAT'S THE MOST COVETED HOUR OF YOUR DAY? I put in some late nights and that’s when I feel the most productive. I share my studio with other businesses, and I love when I can get the place to myself. I like to work on weekends in the winter so I can snowboard during the week—I try to plan my life backwards from other people so I can do things when it’s not busy. I prefer when nobody’s there because I can turn up music and do my own thing. When everyone’s leaving to go home, I go to work. There’s a fine line between craft, art, and design, and I’m always somewhere in between on this spectrum.